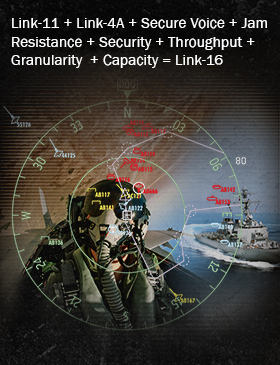 Link 16 is a standardized communications link for the transmission and exchange of real time tactical data among network participants (also known as TADIL J) and uses Time Division Multiple Access (TDMA) to provide multiple, simultaneous communication paths through different nets. Link 16 is the standard by which other systems are measured for airborne situational awareness. In fact, Link 16 has been credited by the U.S. Air Force as being a significant factor in saving lives in Afghanistan due to increased situational awareness provided by the system. Link 16 operates over-the-air in the L band portion (969 – 1206 MHz) of the UHF spectrum (excluding the 1030/1090 frequencies as these are used for IFF). DLS is also a leader in migrating MIDS technology to the Joint Tactical Radio System (JTRS).